Check Facebook page for immediate updates and cancellations. Monday April 15th we will be at Caputi's. Did you win a spot in the February Monthly at 33 Speakeasy? Over 40 came to play, but these guys got the prizes! From left to right: Ed Duquette, Garrett Betz, Scott Heiligenthaler, Mike Flatley. Ed and Scott chopped 1st and 2nd awards, Garrett 3rd, and Mike Flatley took 4th. The River Pub every Tuesday!. 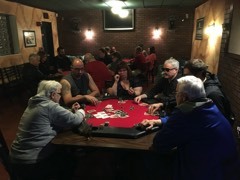 Tuesday at 7 & 9:30 p.m.
Buffalo Pub Poker is committed to bringing fun, friendly, free-of-charge no limit Texas Hold'em poker tournaments, with great prizes, to the bars and restaurants in Western New York that you already know and love. Take a look at our 'Where To Play' page to see what bars near you are hosting our games, and when they are hosting them. Stop on out to one of our tournaments, and see how much fun you can have winning free prizes. Check out our Facebook or News pages to follow the action online. Our players win prizes, but also seats to real money tournaments at real casinos, and in online tournaments! We are affiliated with www.barpokeropen.com, where you can win seats in Atlantic City at the Borgata, Las Vegas at the Golden Nugget, and even our local Seneca Niagara Poker Room! Already a player? Follow your season standings in Season Updates. 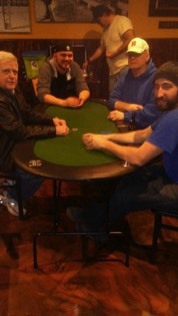 Besides seats you may be eligible for some of the prizes in Buffalo Pub Poker's Treasure Chest! And Finally: We can help you with Private parties, stags, charity events to raise money for your cause!